I remember being confused about the coffee that was put in front of me on the cupping table: sweet but with almost a bittersweet salt caramel taste, some woodiness, a huge rich body and a delicate lemony acidity, the combination and intensities of which luere unlike anything I had tried before. WHAT WAS THIS STUFF? It was May of 2007; I was in Long Beach, California for the annual Specialty Coffee Association of America (SCAA) conference and had just tasted my first Fine Robusta, as it would be defined five years later. All that I knew about Robusta at the time was probably the same as most others working in specialty coffee: it has lots of caffeine, produces thick crema in espresso and is generally pretty awful with a sort of rubbery, petroleum taste found mostly in instant coffee. But this coffee was not awful at all! It was surprisingly pleasant, which made me wonder: "What else don't I know about Robusta?" A friend and mentor, who had organised the cupping, was having dinner with the farmer that same evening and invited me to come along. Nishant Gurjer and I became fast friends. Over dinner, he told me how he was a mechanical engineer working in Bangalore at the time he was thrust into his family's coffee farming business by the untimely death of his father. New to the industry and bringing with him a process-driven methodology, he started to question everything about how his plantation was run. Why, for example, if his land was ideally suited to growing Robusta, was his family struggling to grow Arabica for five generations? Why settle to be another mediocre Arabica grower, he thought, when the soil and weather conditions are right to be one of or perhaps the world's best Robusta farmer? In India, as in most places around the world that grow coffee, farmers choose Robusta as an option of last resort only, where Arabica will not grow, due to its substantial price discount set by the NYSE London financial exchange (LIFFE). 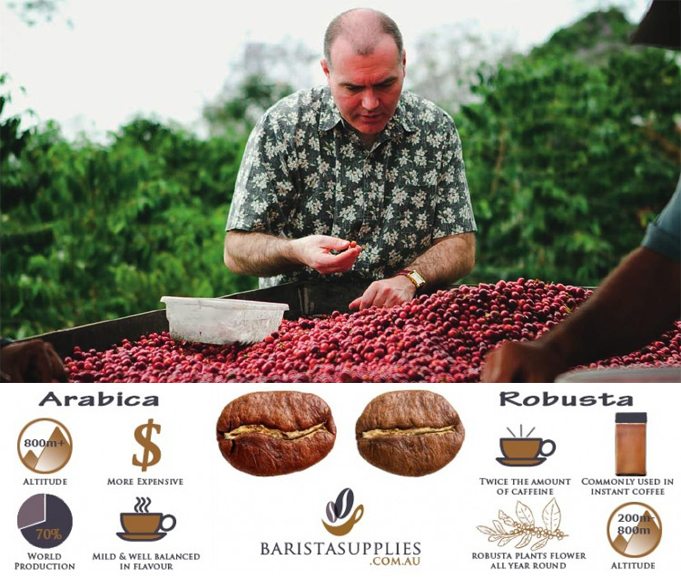 The LIFFE Robusta contract allows for up to 450 defects per 500 g sample, more than 10 times its Arabica "C" contract counterpart for exchange quality coffee, so it's understandable why Robusta coffee is generally worth less than half of commercial Arabica. 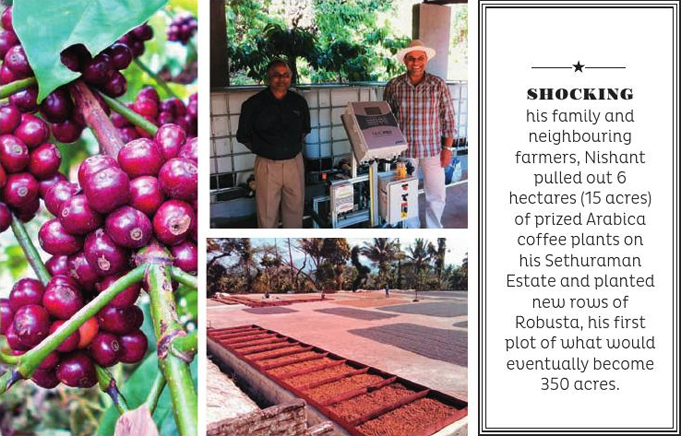 Shocking his family and neighbouring farmers, Nishant pulled out 6 hectares (15 acres) of prized Arabica coffee plants on his Sethuraman Estate and planted new rows of Robusta, his first plot of what would eventually become 350 acres. He recognised that it was the artificially low market standards that are holding back the value of Robusta, not the plant's potential at all. Since there is no economic incentive for most Robusta farmers to improve cultivation and processing quality standards, most treat it as a secondary crop and take the absolute minimum care and make the lowest possible investment necessary to bring it to market. Lacking a specialty coffee market outlet similar to Arabica that rewards achievement, Robusta farmers remain caught in a race to the bottom, in which the lowest quality product receives the highest short-term economic gain in a perpetual downward spiral. This economic imbalance has also stifled scientific progress in Robusta coffee, despite its genetic potential to do so much more than Arabica. Robusta cultivars have wide ranges of characteristics, grow in highly variable climate conditions and are cross pollinating, unlike Arabica, which means that they develop complex regional gene pools that allow for natural evolution of the species without human intervention. Even before considering Robusta's wider tolerance for high temperatures, natural pest resistance and higher yield per plant, its genetic diversity allows the species greater adaptability to our real world challenges of stressed global coffee supply and the looming dangers of climate change. 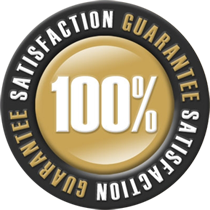 The Coffee Quality Institute (CQI), a charitable trust of the SCAA, saw these issues and potential for wide-sweeping improvement long before my between seasons. When you visit Nishant's Sethuraman Estate, as I did for the first time a little more than a year after our dinner meeting, at a glance it's not easy to tell from the sophistication of the operation or condition of its facilities whether you're approaching an Arabica or Robusta farm. From its carefully manicured rows of coffee or meticulously clean drying decks, it could be any top Cup of Excellence™ producing estate anywhere in the world that employs carefully orchestrated land management, uses cutting edge farming technology like computer controlled drip irrigation and advanced environmentally friendly practices for conserving water and producing 100% of its own organic compost fertilizer.